International Metal Source prides itself on dealing in even the rarest metals. IMS offers a wide variety of services to ensure your metal is ready to use on arrival. IMS has received ISO 9001:2015 and AS9100:2016 certifications, and other awards. Stop in, call, or email anytime. Add us on facebook! Getting a quote has never been easier. 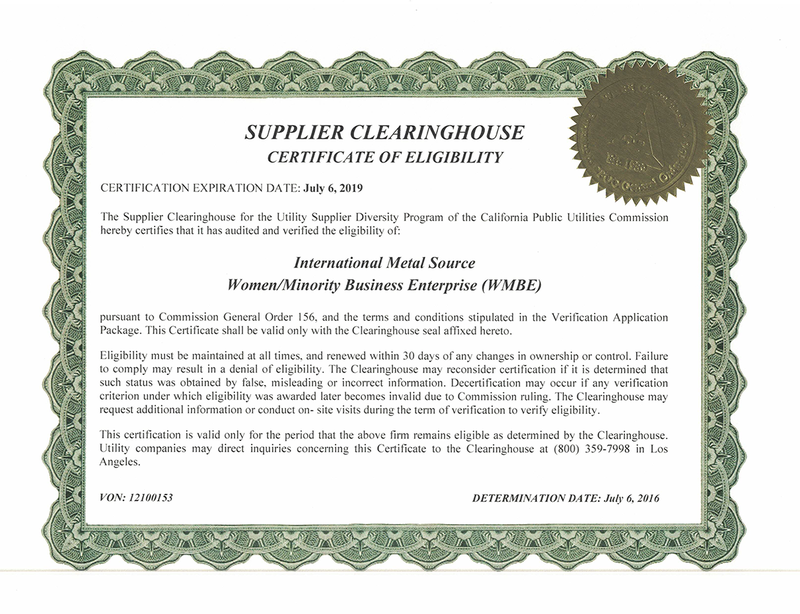 International Metal Source (IMS) in Cerritos, CA is an AS9100/ISO Certified, Women and Minority Owned Small Business specializing in research, analysis, processing, and delivery of hard to find exotic metals and materials. The IMS team’s goal is to change how materials are procured and processed throughout the world by increasing client productivity and operational efficiency. IMS strives to be the primary source of all metal products for Aerospace, Defense and Satellite companies by offering quality, excellence, and continuous improvement while maintaining loyalty and integrity for all clients. Since 2009, the IMS’ commitment is to consistently deliver high quality materials to its customers domestically and abroad. Not only does the company provide the materials for critical parts in satellites and aerospace components among other classified projects but also facilitates material processing which minimizes overall costs, reduces lead times and increases resource utilization for supply chains of all types. IMS is an innovative company currently developing industry changing technology and establishing benchmarks for service which have never been seen. It is unique in its ability to assist its customers in research & development by allowing for the use of its equipment to learn, prototype, and experiment with efficient results garnering innovation awareness and loyalty in the scientific community. In addition, IMS offers internships to encourage youth and upcoming professionals to become indoctrinated in aerospace engineering and material science professions while simultaneously endeavors to save craftsmanship in manufacturing and represent small business capabilities throughout the world. Click the certification stamps on the bottom of this page to view the full certificate.